Allison Glenn has been practically perfect since birth. Beautiful, blonde, and talented she always appeared to be one step ahead of those around her. As the brightest star of her small town, Allison excelled in everything she set her mind to—until that one fateful night when she did the unthinkable. The town of Linden Falls will never forget that heinous crime committed in the darkness of that night. Allison Glenn has had five years in prison to remember every detail of what she did. Now her time behind bars is up and she is free to once again live life outside the confines of a prison cell. However, Allison has not been alone in her guilt and the neverending memories of that horrific night; her younger sister, Brynn, lives everyday with the reality of what happened and the anger of the town continually surrounding her. Struggling to define a life for herself, Brynn fights to keep separate from a sister she once adored. Do the future lives of the sisters lie in forgetting the past or must they both go back to that one defining moment to ever find peace? And if there is peace after committing the ultimate crime does anyone truly deserve it? 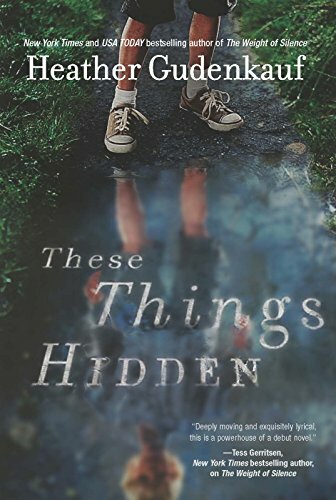 From the very first chapters, These Things Hidden offers twists and turns that will surprise even the most seasoned reader. Sometimes life is not black and white. Sometimes even the most tragic events have secrets hidden within and the most evil individuals have truths not revealed. The effects of one crime have changed the lives of many, some of whom remain unaware of its influence on their daily paths. Through multiple voices and emotionally riveting accounts, Gudenkauf makes one night on a riverbank real for not just her characters but for her readers as well.